Governor Jay Nixon’s final State of the State address will be given four weeks from Wednesday. State representatives have been told Nixon will deliver his speech to the state House and Senate in the House Chamber at 7 p.m., Wednesday January 20. The State of the State is when the governor lays out his legislative and economic priorities for the legislative session that will have started January 6, and will present his recommended budget for Fiscal Year 2017 which begins July 1. The governor and the legislature have not announced a consensus revenue estimate – an agreement between the two on a prediction of how much tax revenue the state will have, to build that budget on. 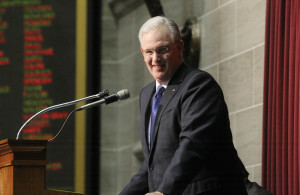 Nixon told Missourinet he believes the two sides will agree – they did not going into the 2014 legislative session – and believes it will be on a projection of about 4.1-percent growth. Nixon said budget priorities for him will be supporting K-12- and higher education, in part to protect his agreement with the state’s two- and four-year colleges and universities to freeze tuition; and to continue to help those with mental health needs. Other priorities he has stressed and is likely to talk about in the address are ethics reform and transportation funding. The State of the State Address will be streamed live at Missourinet.com.